Kate, Debbie and I emerged from Queensway tube station, to promptly go in the wrong direction. I have to say this was under my instruction. Debbie was saying she thought it was the other way, and she was right! 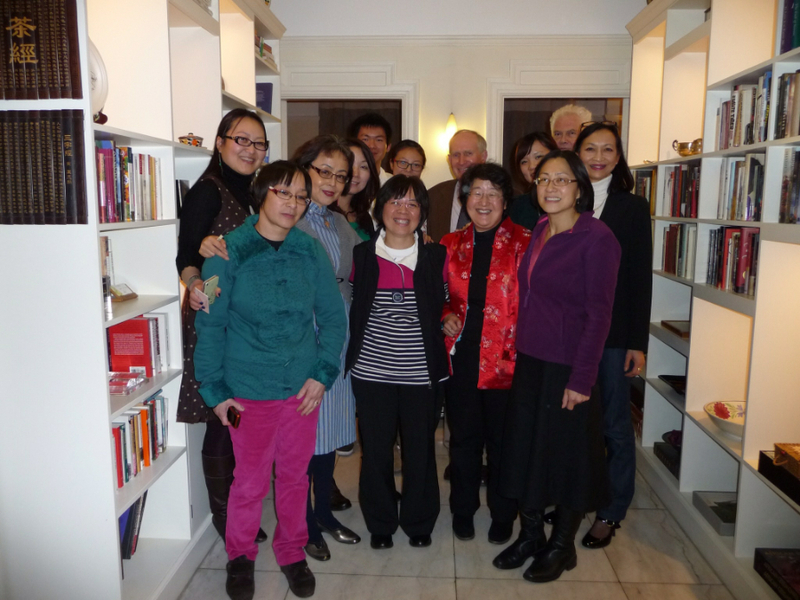 Our invitation to Xinran’s home was, from what we could gather, a meeting place for us to talk about ways in which we could support her organisation, because of our experiences of having been adopted. It turned out to be so much more than this as we were also invited to have Chinese tea with her. When arrived we were greeted by Xinran and a number of student volunteer workers. In fact there were 15 of us in total! It was so lovely to meet such welcoming and talented people – the students are studying subjects such as global Chinese economy at King’s College, and of course their English is brilliant! For Chinese tea we were given 3 types of tea and there were a selection of Chinese (and French) biscuits. In the centre of the table was a bunch of daffodils – common to us as an indicator that spring has arrived, but also, as we found out, in China the white daffodil is a symbol of wealth and good fortune and is grown especially for the New Year. We were all invited to talk about ourselves and while we were doing this a surprise was being set up for us. Xinran presented us with a ‘gift’, which was an amazing performance from one of the students on a Chinese Erhu played by a young Hong Kong boy who is a third year student at the Royal academy for music. He played a piece of music called Hope! It was a very moving experience. Eventually it came to the point where we needed to drag ourselves away from Xinran’s home as it was getting quite late. With great reluctance we left, but in the knowledge that a friendship has been established between UK HKAN and MBL. Wow, what an awesome and wonderful experience meeting Xinran. I would have loved to be in your shoes Debbie. I have read “Good Women of China” and “Messages to an Unknown Mother”. What an insight to the horrors of women being forced into becoming sterile or aborted, let alone being a woman in China. As I kept reading the pages, I kept thanking God for saving me and giving me a life of freedom far away from my birth country. I have never desired to know my race and culture but surprisingly when I went to Hong Kong in 2010 for the very first time since leaving for NZ at the age of 6yrs, I attended two adoptee reunions. I felt a tremendous sadness for a little girl having been ripped away from her home in Shatin and not knowing why she couldn’t be with her own people. These reunions in the UK must bring much comfort knowing they are never on their own with questions unanswered.